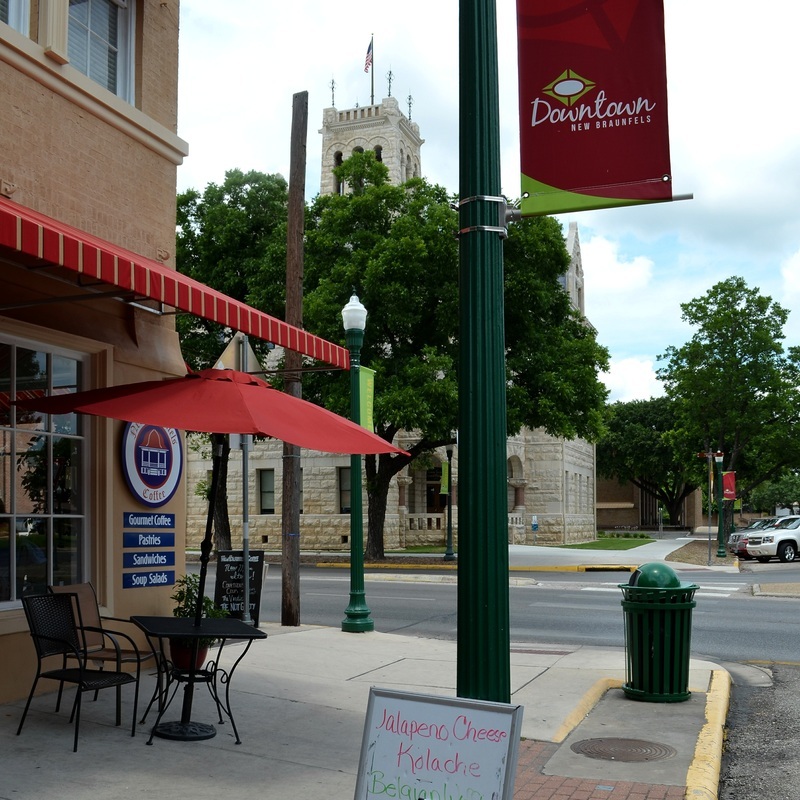 "Spanish explorers were familiar with the Comal Springs area but evinced little interest in settling the region. 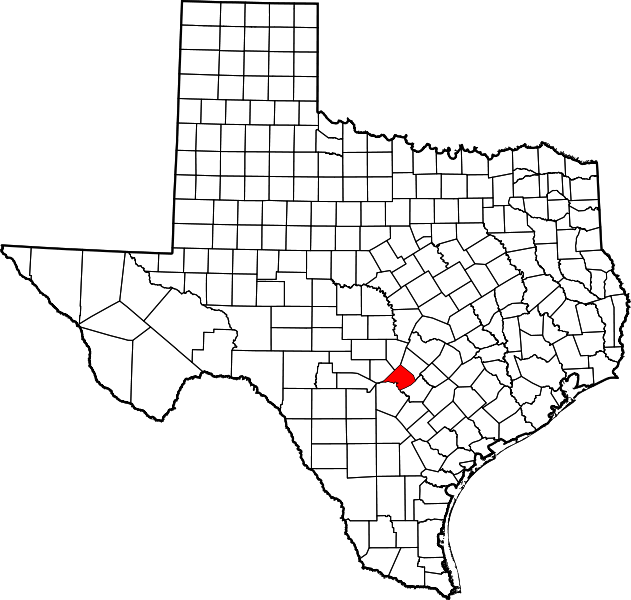 After the expedition of Domingo Terán de los Ríos of 1691, the Old San Antonio Road crossed the Guadalupe River near the future site of New Braunfels. 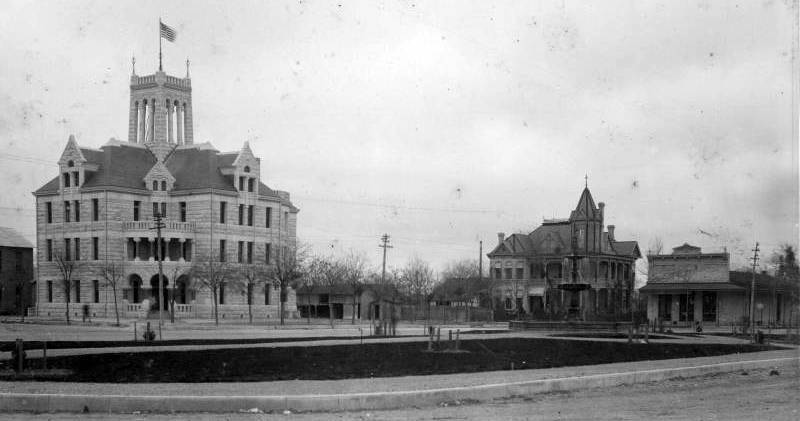 "During the eighteenth century the springs and river (which had been called Las Fontanas and the Little Guadalupe respectively) took the name Comal, Spanish for "flat dish." 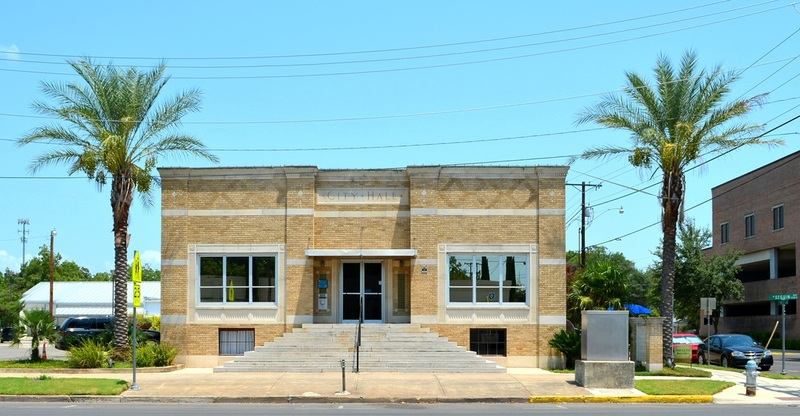 It is thought that the name was suggested to the Spanish by the numerous small islands in the river or by the shallow basin through which the river runs. 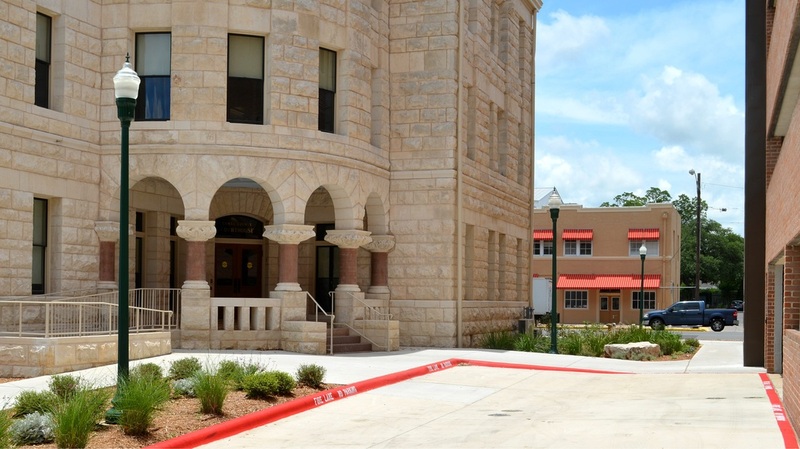 "Permanent settlement of the county began in 1845, when Prince Carl of Solms-Braunfels secured title to 1,265 acres of the Veramendi grant, including the Comal springs and river, for the Adelsverein. 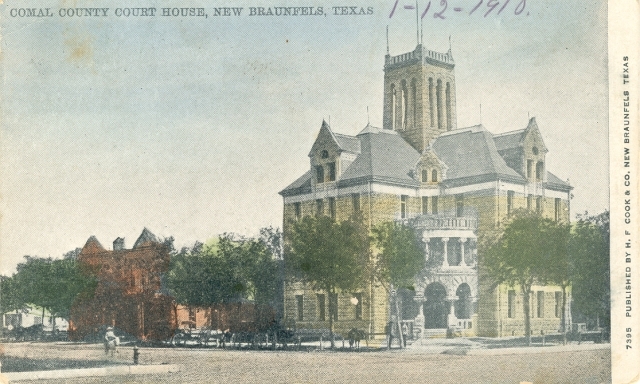 In succeeding years thousands of Germans and Americans were attracted to the rich farm and ranch land around New Braunfels. 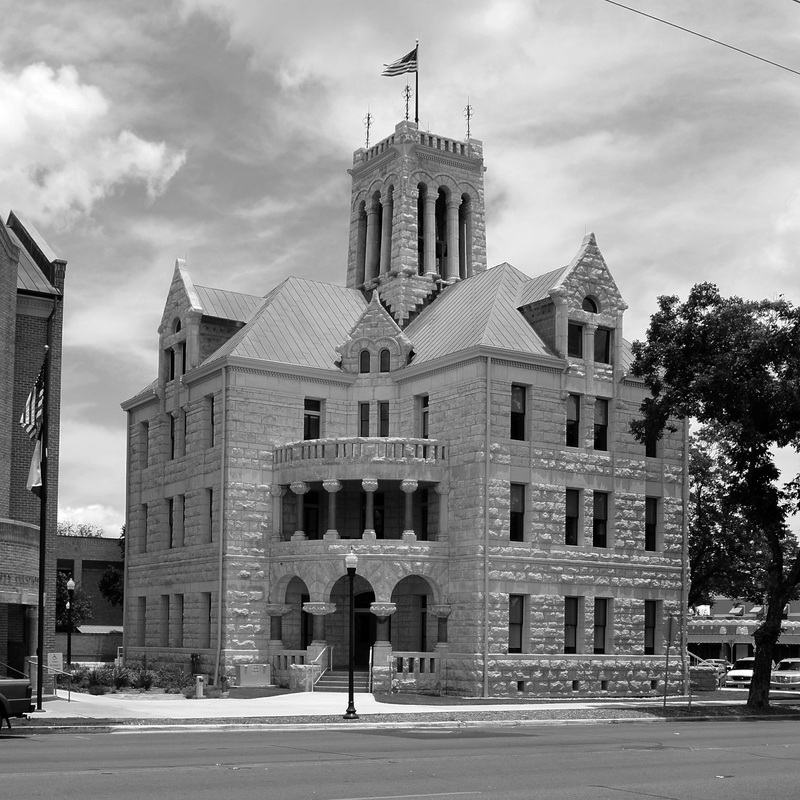 Settlement progressed rapidly; in March 1846 the Texas legislature formed Comal County from the Eighth Precinct of Bexar County and made New Braunfels the county seat. 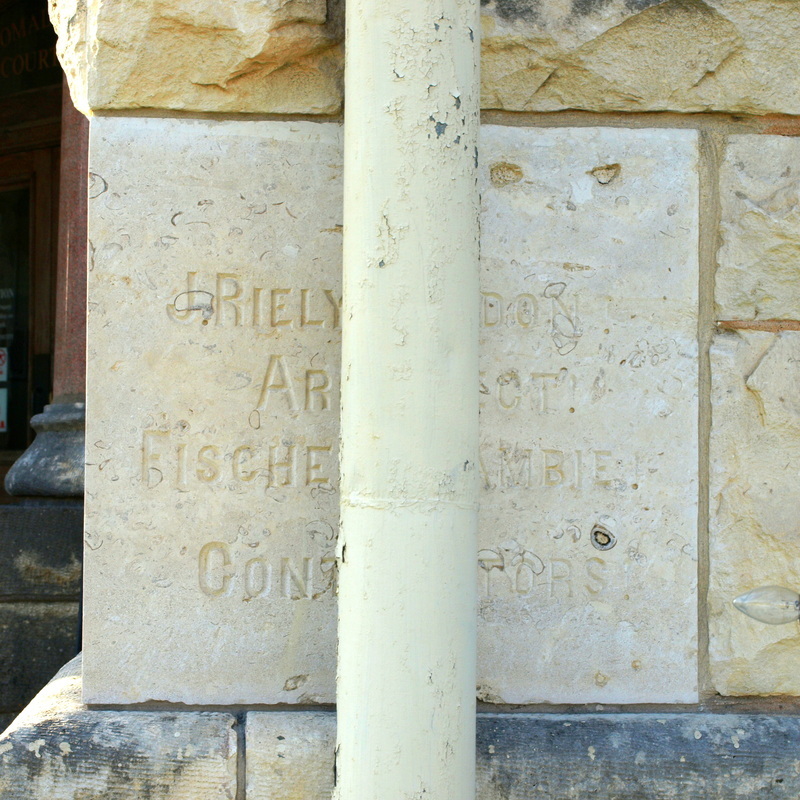 The final boundary determination was made in 1858 with the separation of part of western Comal County to Blanco and Kendall counties. 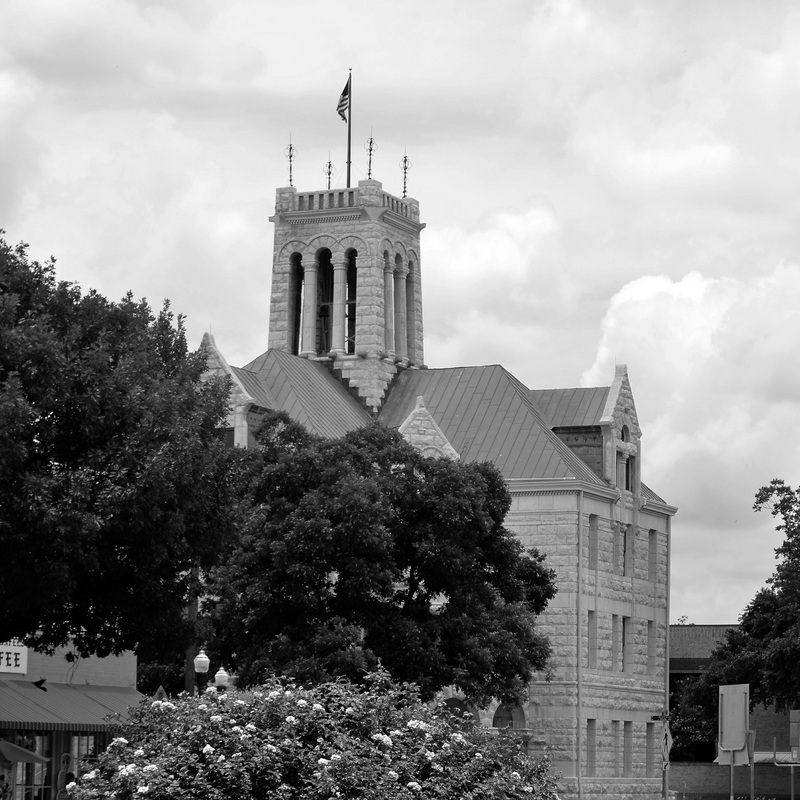 "Comal County was founded and initially populated under the sponsorship of the Association for the Protection of German Immigrants in Texas. 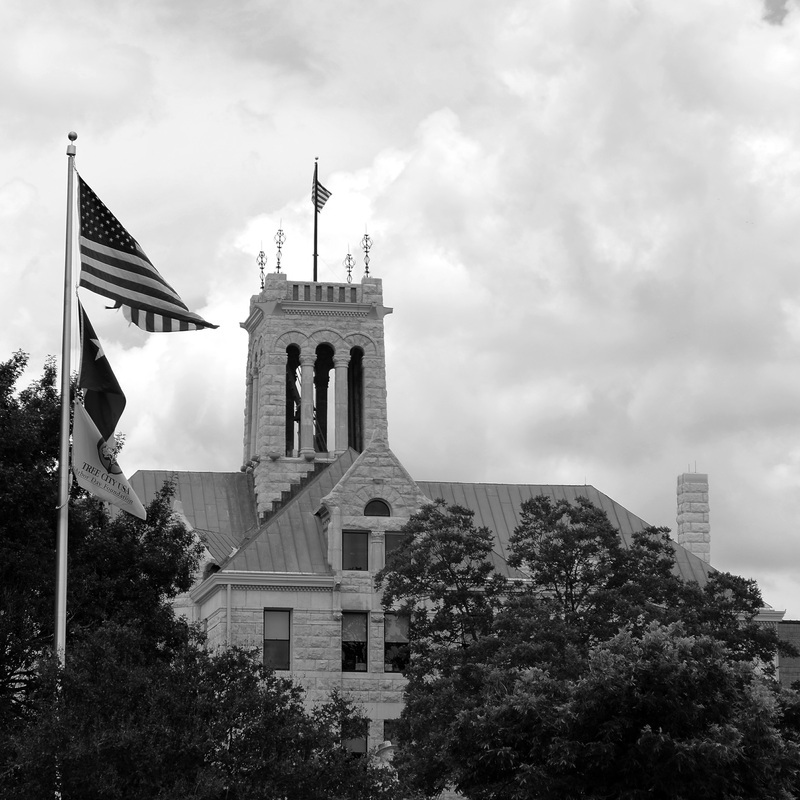 The county was perhaps one-half German-born in the 1850s." 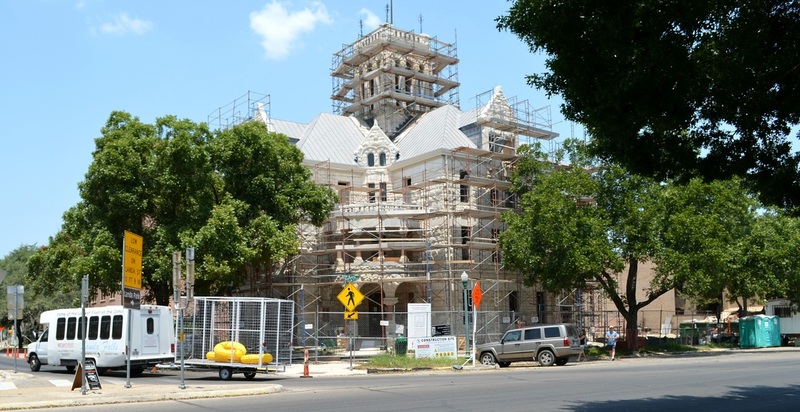 I visited Comal County and photographed the courthouse on March 26, 2010, on August 11, 2012 (during the courthouse restoration) and on June 8, 2013. 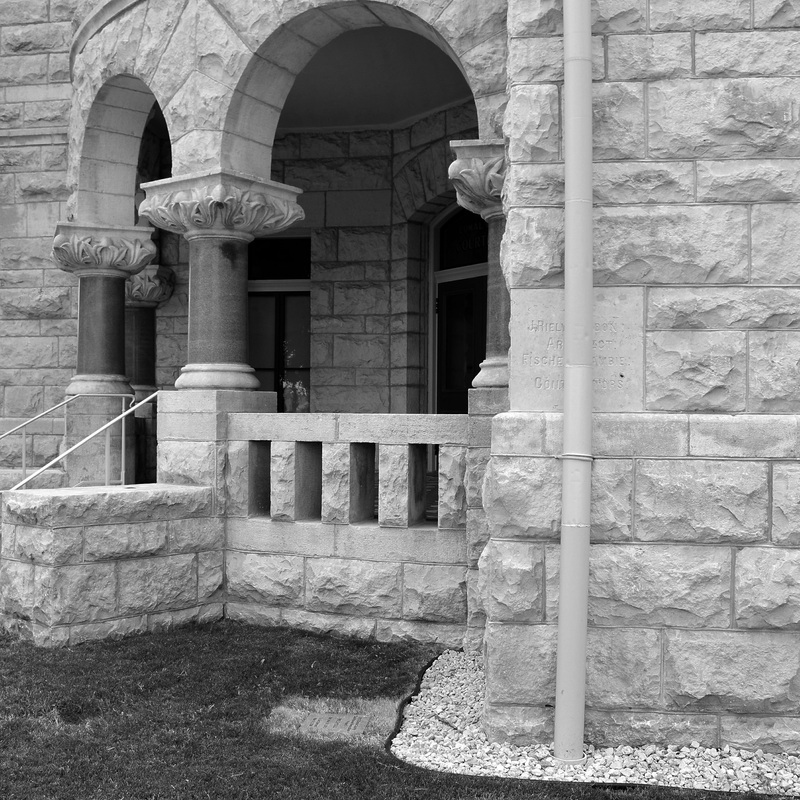 A roof drain leader or downspout installed over the building cornerstone. 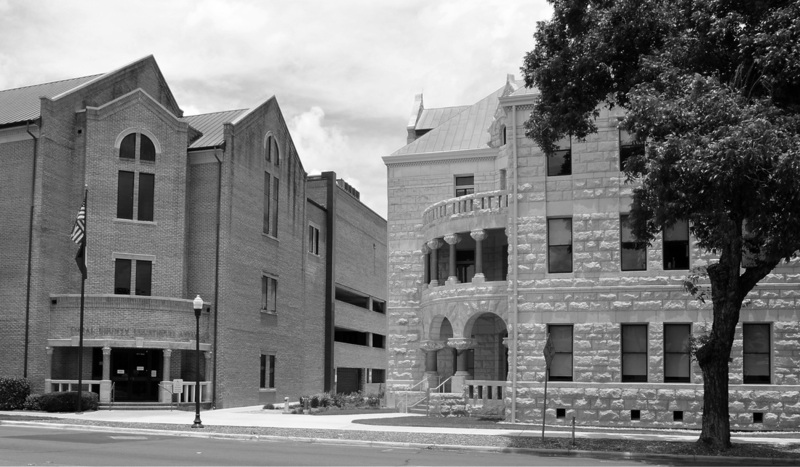 It's been there awhile; you can see it in the 1939 photograph. 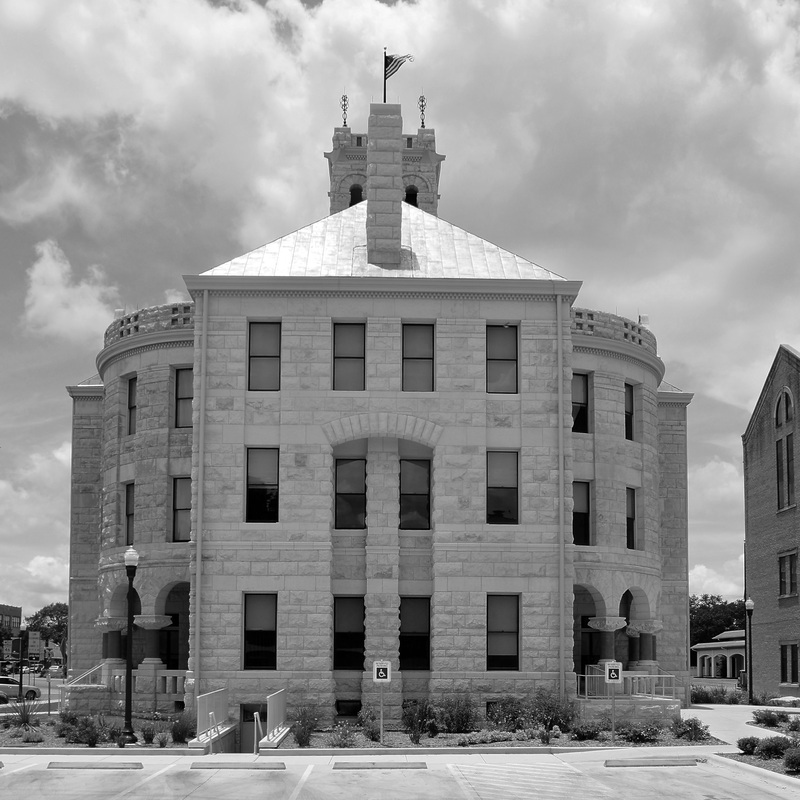 "Located across from the northeast corner of the public square, the Comal County Courthouse is an excellent example of Romanesque Revival design, as interpreted by architect J. Riely Gordon. 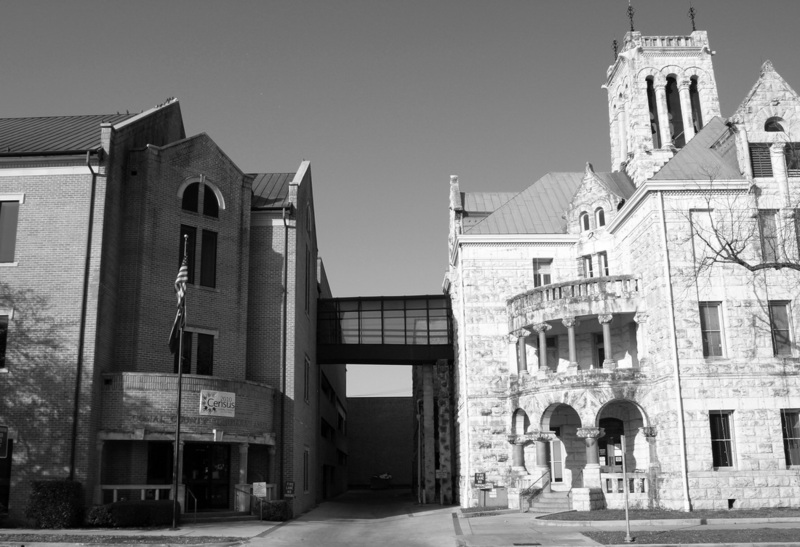 "The main entrance is on the southwest reentrant angle of the Greek-cross plan. 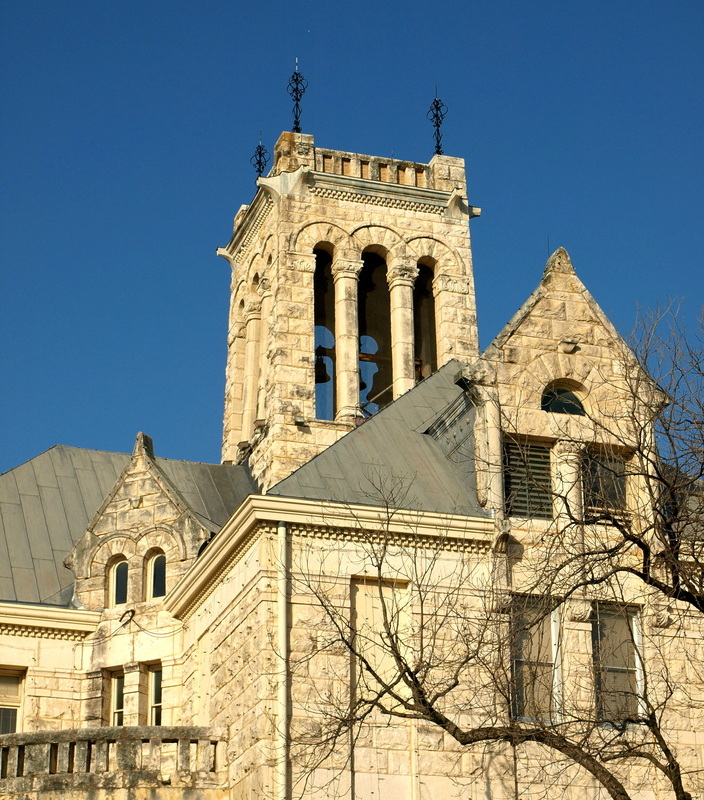 The courthouse plan based upon the Greek cross had been used by Gordon for several other Texas courthouses and the architect claimed a copyright on the arrangement. 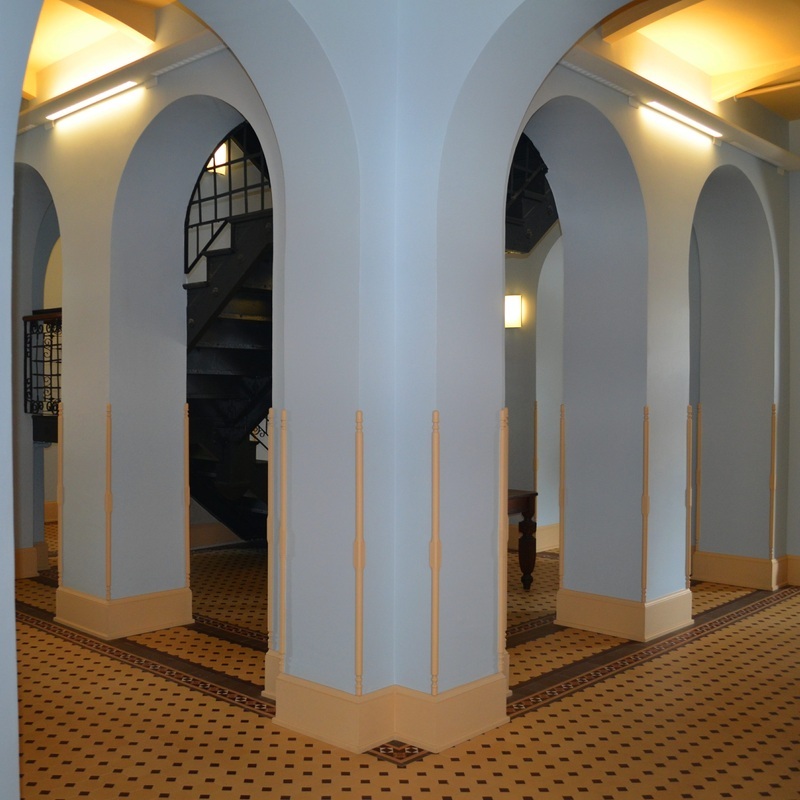 "The exterior walls are native limestone in a handsome light gold color. 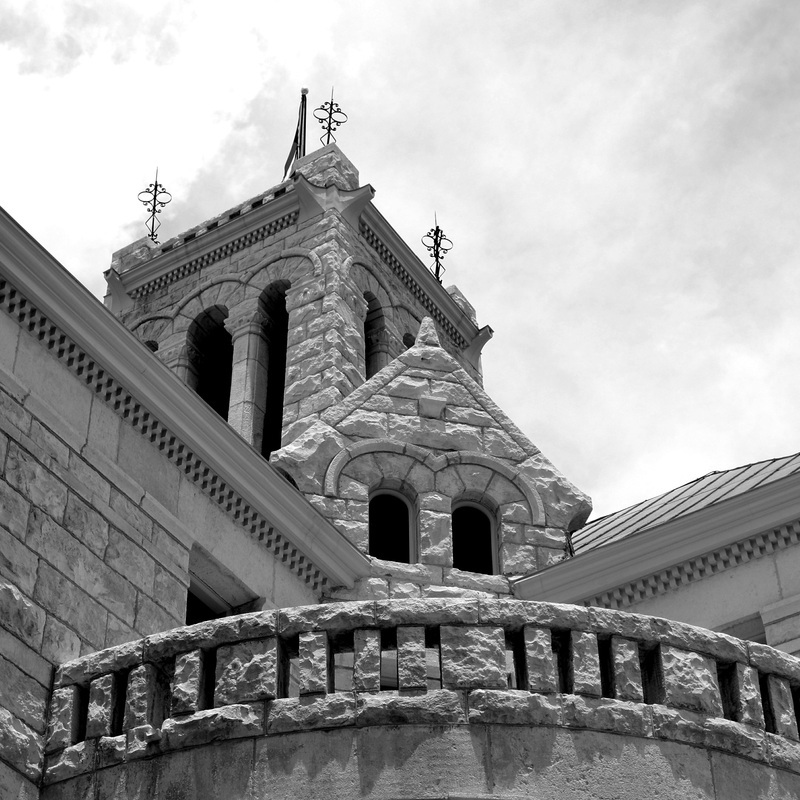 The texture of pitch-faced ashlar was subtly accented by cut-stone lintels and delicate stringcourse moldings. 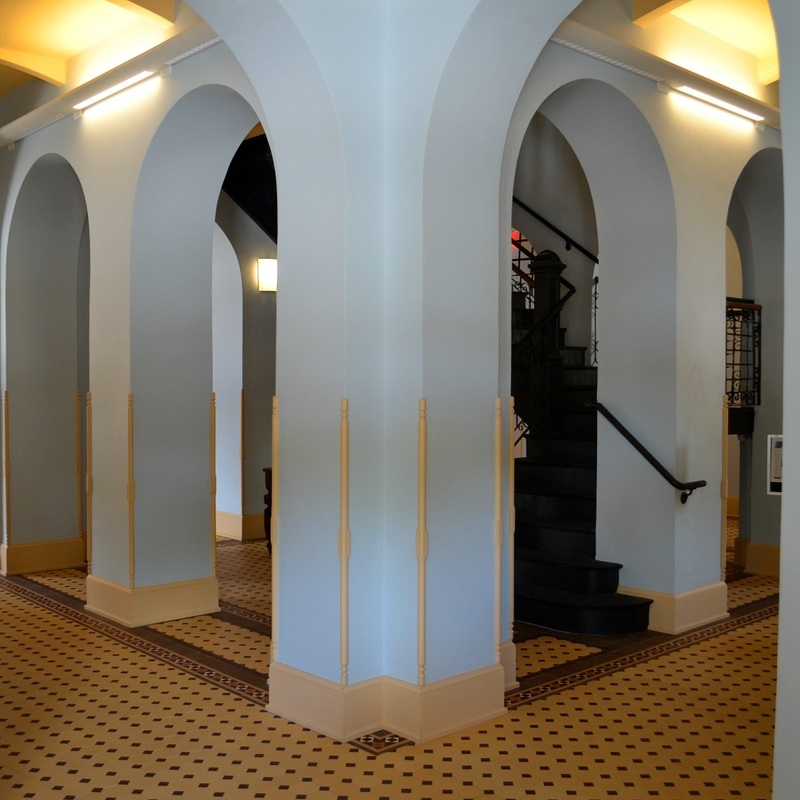 The entrance porches are also noteworthy. 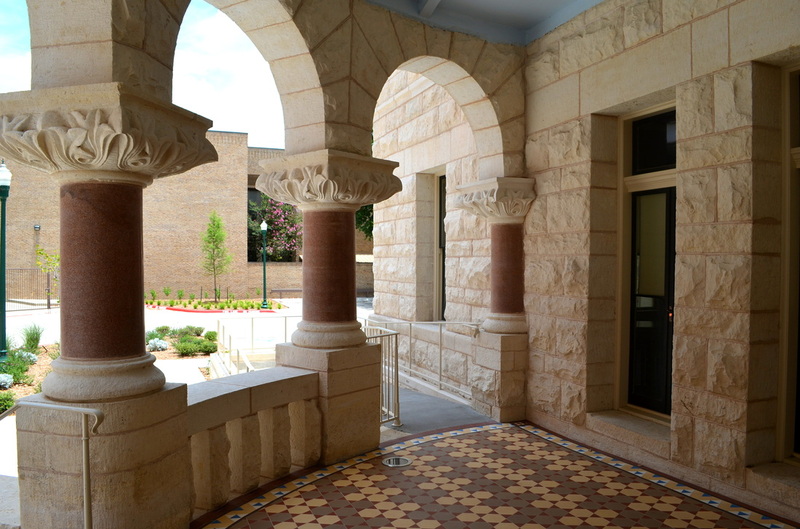 Supporting the entrance balcony are polished Syrian columns of pink granite; overhead, slender columns support capitals with handsomely carved Sullivanesque details." 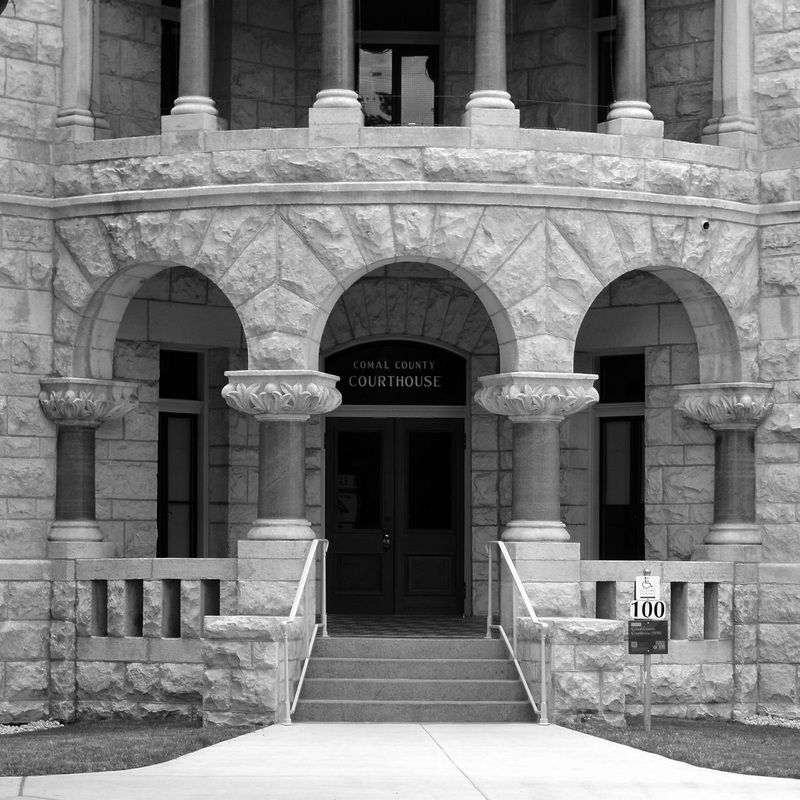 As noted above, Gordon designed several courthouses using this plan. 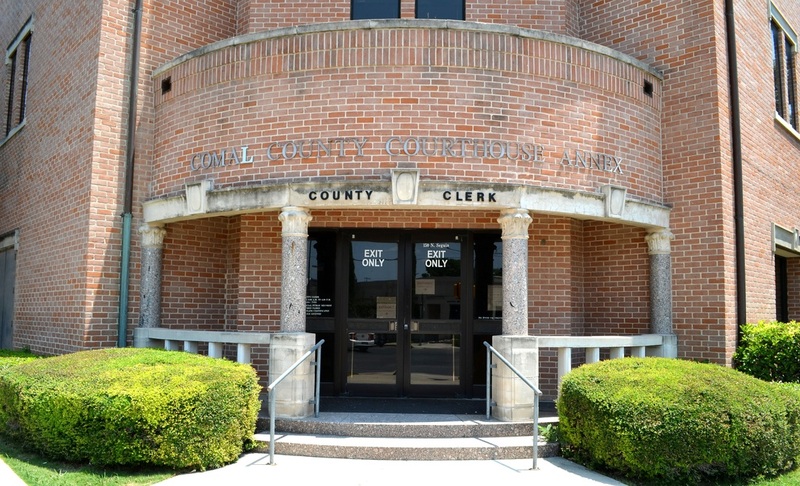 Compare the ﻿Lee﻿ and Gonzales County courthouses to Comal County, for example. 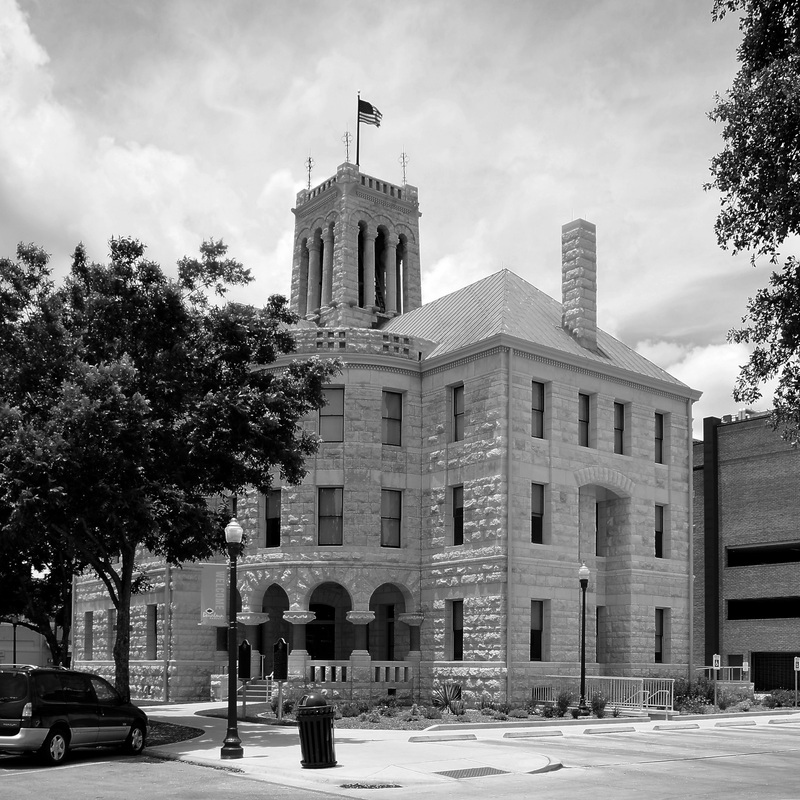 Following an $8.6 million restoration, the Comal County courthouse was rededicated on January 22, 2013. 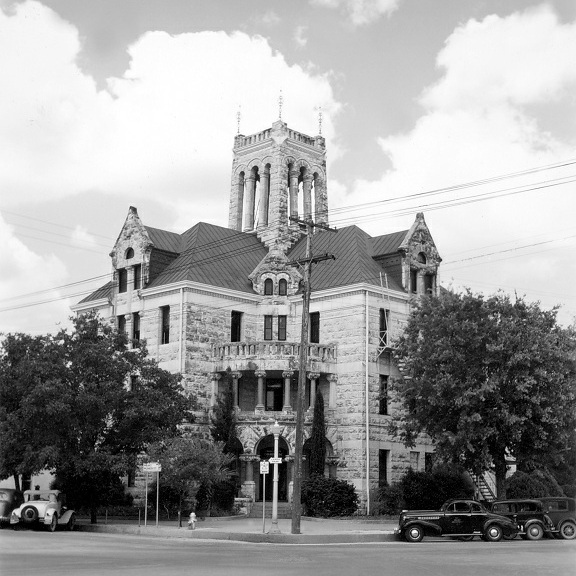 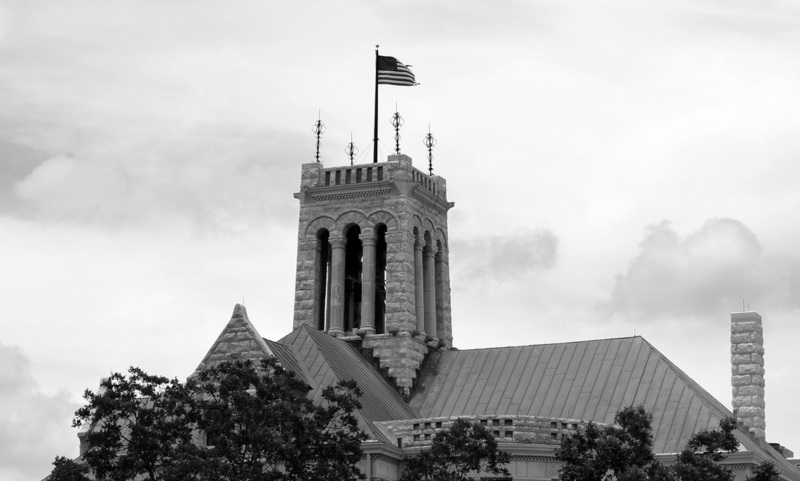 Compare this tower to the Lee County courthouse tower designed by Gordon soon after the Comal County courthouse. 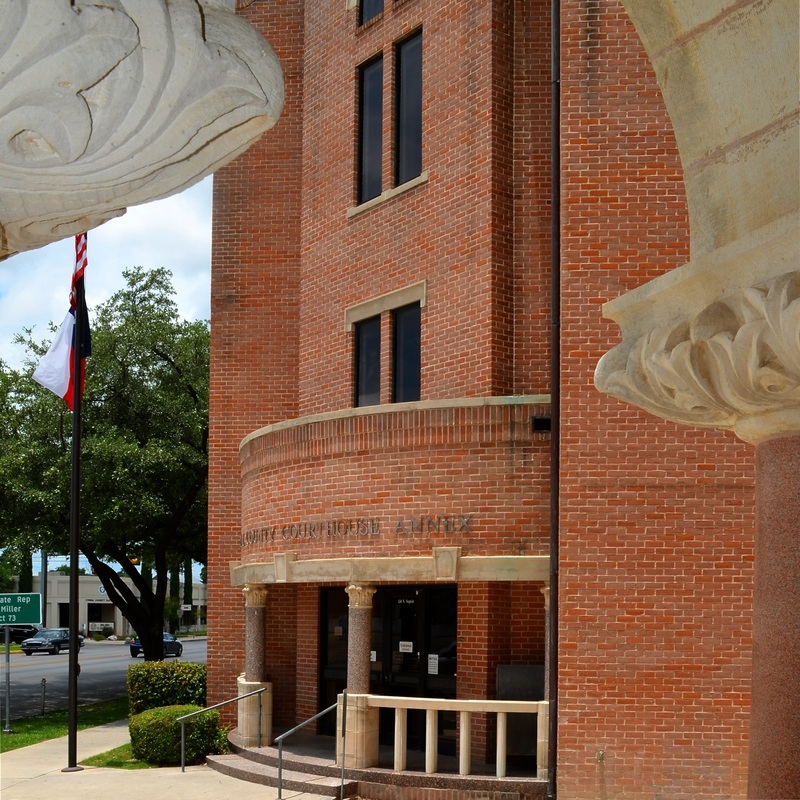 The Lee County courthouse in Giddings. 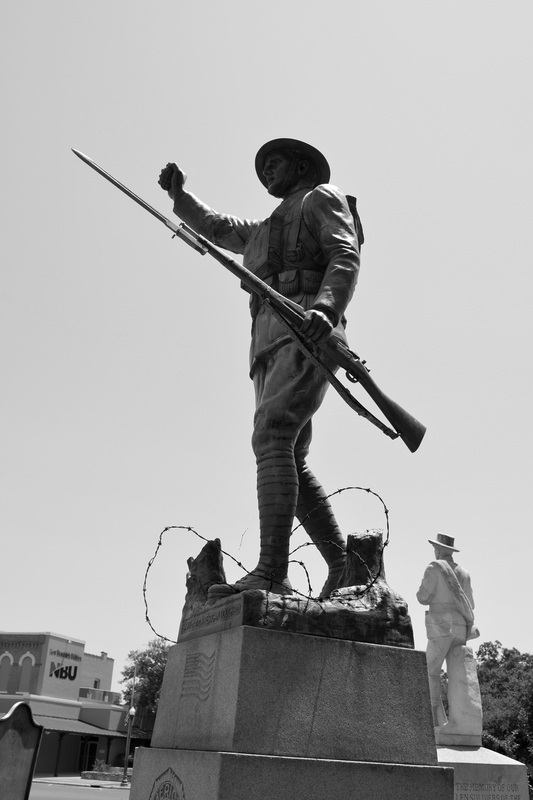 World War I memorial, the Doughboy, created by E. M. Viquesney, a Spencer, Indiana native. 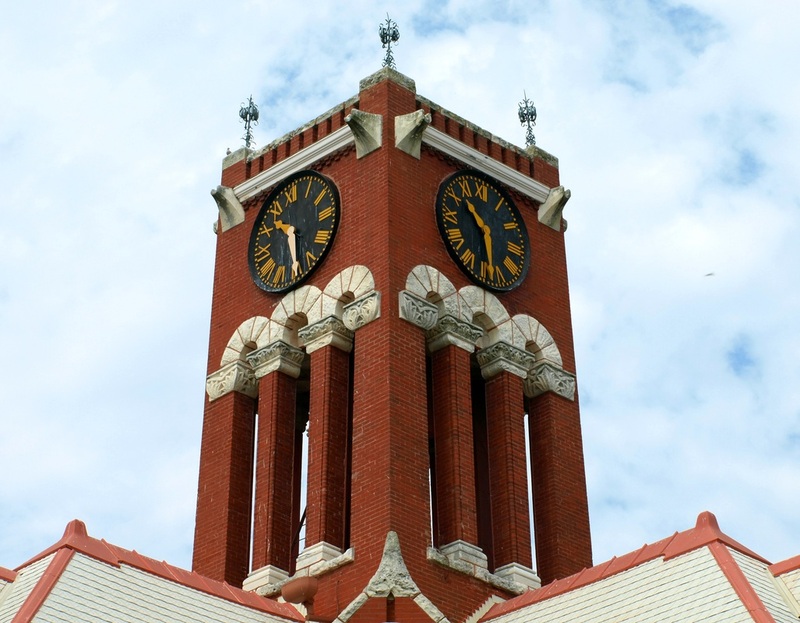 It sold for $1,000 from the Sencer factory, plus the base. 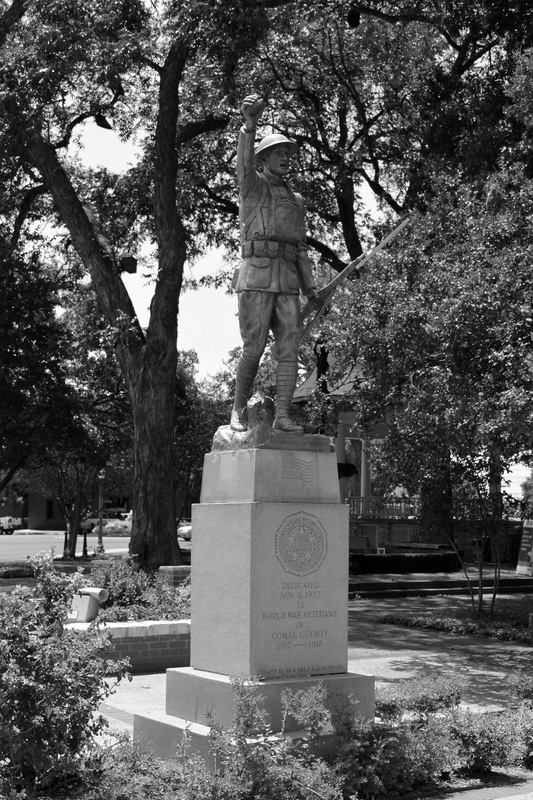 I've found this statue in Angelina County, Limestone County, and San Patricio County, in addition to Comal County. 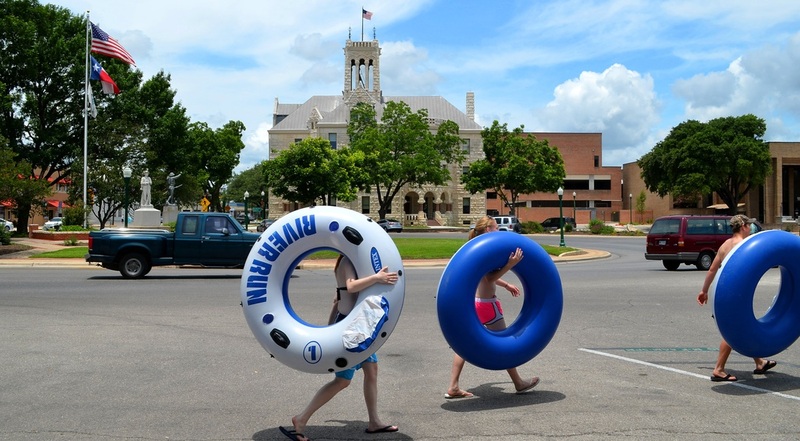 I'm sure there are more in Texas. 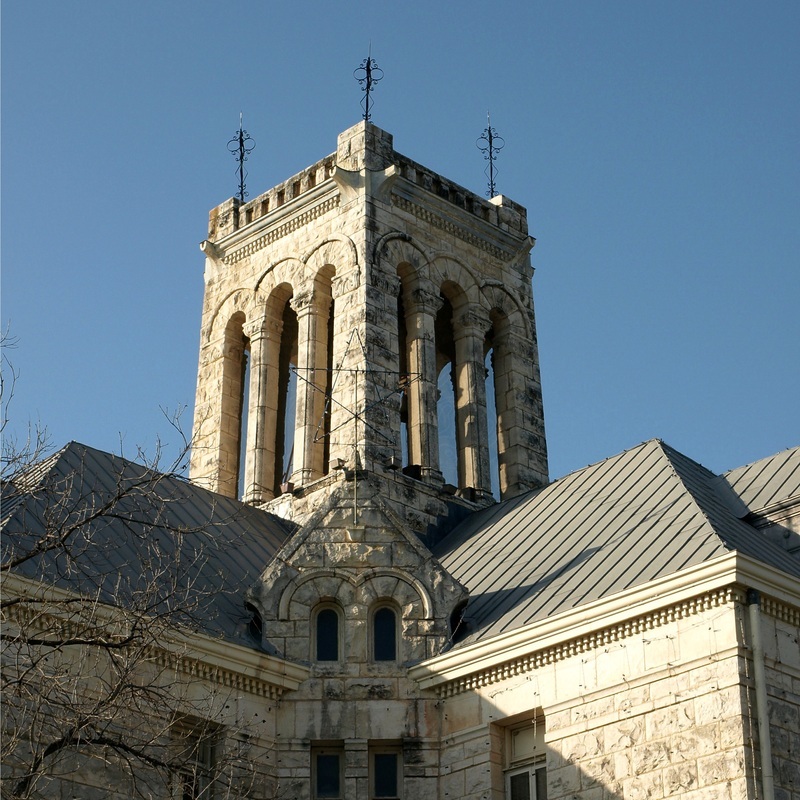 Architect for the restoration is Volz & Associates, Inc., of Austin, Texas. 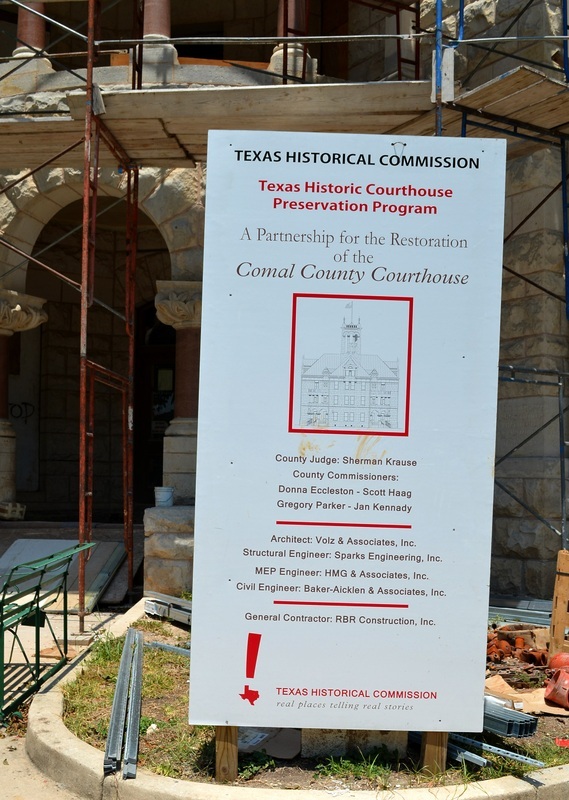 Click here for the Comal County courthouse restoration website.